So I had a meeting in a terribly desolate part of the burbs (East Scarborough) and on my way home, I had to pop in quickly at the Perfume Outlet store on the corner (no word of a lie, it really was called this) because… well it was an outlet store! I love a good deal lol what else can I say?! So in I go, I walk around, lots of stuff looks crappy… but they have 1 bin full of, in the far back corner, fake eyelashes! and sure they had some almost regular styles but the best thing was the crazy colourful, pretty, costumey ones! They were named Fairy Lashes, Pixie Lashes, etc. And so cute! My mind is going a mile a minute and I grab a few different styles and decide that I really don’t need them so 4 should be enough for now. I also thought they were $2 each since the bin was marked as such and didn’t feel like paying more than that (which is about 1/3 of the regular price anyhow, since these lashes usually come out right before Halloween for about $6-8 in the drugstore). Well was I in for a shock. They were 2 pairs for $1. Had I known, I would have raided them. But after all that I didn’t feel like going back and waiting in line again behind all the perfume bargain hunters. So I took my 4 pairs and left feeling quite happy! How perfect for Caribana are they!? My mass-playing clients will look extra fun this year! So excited! Have you had a special “surprise” sale happen to you lately? which item/where was it? Share the story! My new favourite HAIR thing! A couple months ago, I saw a video ad somewhere (can’t recall where) for a new hair styling product by Goody. They were called “Spin Pins” and have this double helix type shape to twist into hair during up-do’s to hold hair securely in place. The hair artist demonstrating them said that one of these bad boys replaces the equivalent of 20 (twenty?!?!) traditional bobby pins. I was sold. I spotted them in Walmart for about $7 at that time, although now the current price is $5. There are 2 colours in them, a burnished silver type colour for light hair & a dark brown for… You guessed it. It also came in 2 package variations, 1 with 2 large pins or 1 with 3 small pins. 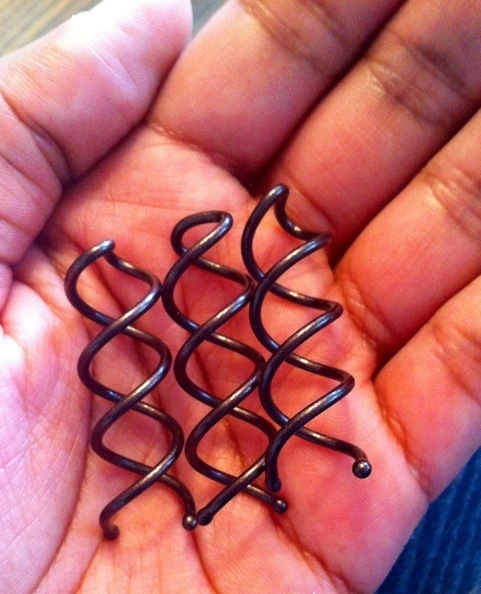 I picked up the pack of dark brown small Spin Pins from Goody & tried them out. They were great! They are super sturdy & strong, easy to use & blend well to hair. But, I wish I had bought the long ones because even for mid-length hair like my own, I think nearly everyone would do best with the longer length. They don’t replace 20 pins like the ad-artist said but they replace about 5-6 which still makes it a fantastic & worthwhile hair product. This was ALMOST about to be my new favourite thing. Almost. 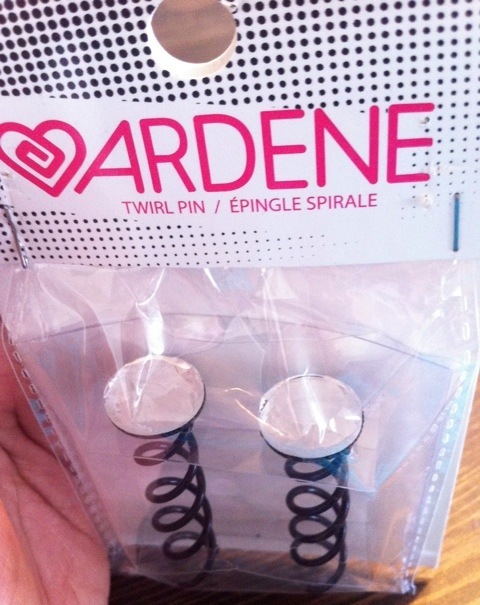 Then I dropped in to my local Ardene store a couple weeks ago & saw, none other than the most fabulous dupe: Twirl Pins. 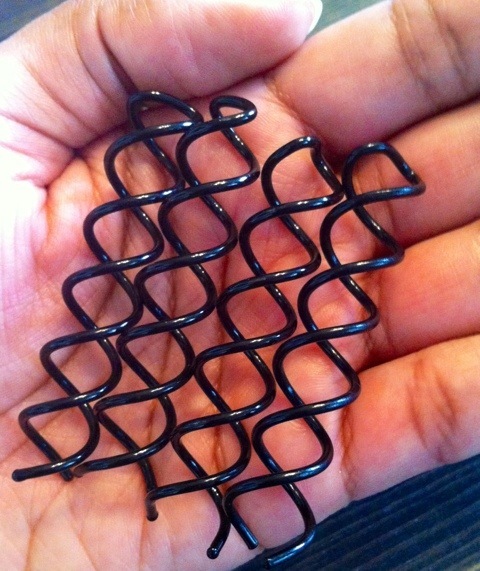 Ardene had these in packs of 4 long ones in either black or burnished silver at $3.50/pack or 5 packs for $10. Can’t beat that! On top of it, they also had some fabulous decorated ones with either pearls or Gemstones (like in my photo) with the long length & in packs of 2 for $3.50/pack or 5 packs for $10. Perfect for bridal hair! I raided all their racks & purchased every pack. And I feel a little naughty for taking them all. But I also feel quite pleased with myself for finding this great dupe! If you do bridal or prom hair or have your own big event coming up, be sure to get a few of these for your hair & you won’t have any worries about hair flubs during your event! Have you tried these yet? Tell me about your experience! A concealor question answered: Yes, Eve Pearl “Salmon” concealor is probably the best thing on the market since sliced bread. It works with an orangey tinge to combat blueish undereye circles (according to the colour chart, this is the opposite of blue, ther efore neutralizes the dark circles). You can order it here: http://www.evepearl.com/products/concealers-salmon/ and if you have their professional discount which you can get here: http://www.evepearl.com/professionals_register/ and it gives you a 30-40% discount if you have the appropriate pro credentials. BUT, although I have tried it, and have loved it…. there are dupes. My other dupe that I have tried and love, and lives in my professional kit is from Joe Blasco. I ordered it here: http://camerareadycosmetics.com/products/joe-blasco-neutralizers-and-tattoo-cover.html since I have their discount which saves me about $2 I think off the cost of this stuff (not to mention all the other stuff I buy there!). I use it in my kit just the same as the Eve Pearl Salmon concealor and I have both shades for under eye circles, the “blue neutralizer” and t he “special blue neutralizer”. I have no idea why one is more special than the other. The one that is “special” just seems a tad more orangey and is perfect for darker skin tones while the regular blue neutralizer is better for lighter skin tones. IMO. This stuff is 1/4 of the cost of the Eve Pearl concealor and EP’s is 6.2 grams, while the Joe Blasco neutralizers are 6.5 grams. Not only does it work just as well, but it’s also wayyyyy cheaper and you get more product?! Sold.